COLIN'SKeeping our customers on the road since 1996. 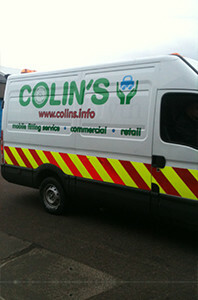 At the start of 2011, Colin’s invested in two fully equipped mobile fitting vehicles. This is a return of a service we provided for a variety of customers. These included Multi-national, Construction, Haulage and Courier vehicles. We know how important it is for our customers to remain on the road and with those unfortunate moments in life there is now no need to worry. With our Mobile Fitting Vehicles and fully qualified technicians we can now come to you. We provide this service for all vehicles. Whether it be Car, 4×4, Van, Motorcycles, Commercial, Light Truck, Agricultural, Truck, HGV, Trailers, Caravans or Forklifts. We do it all! Colin’s cover all areas within the Aberdeen & Aberdeenshire area. We will also go further afield as & when required. If you require this service please do not hesitate to contact us, and we can get you back on the road! FOUR EASY STEPS TO ORDER YOUR MOBILE FITTING. Call and speak with a member of our team and let us know the location for the driver to come and fit your new tyre. Make our driver aware of the tyre size and brand and also the make and model of the vehicle that needs the fitting. Once we have all of the tyre specs and your location we will send out one of our mobile fitters to fit your new tyres for you. Once our mobile fitter has taken care of your problem you can get back on the road and enjoy the rest of your day. 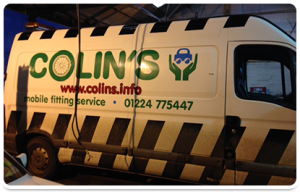 COLIN'S PROVIDE A MOBILE TYRE FITTING SERVICE TO ANYONE REQUIRING THE FACILITY. WE CATER FOR A LARGE VARIATION OF VEHICLES AND TYRE SIZES SO WE ARE SURE TO BE READY TO ASSIST YOU. All Colin's MoT's are approved by the Government appointed Vehicle Operator Services Agency (VOSA) and all MoT tests are completed by MoT testers nominated by VOSA. 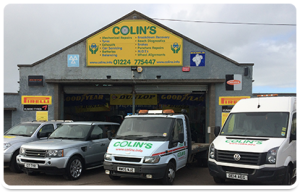 At Colin's we can cater for and repair all your mechanical problems. With labour and parts all fully guaranteed - why pay more elsewhere? Call us today with your problem and one of our fully qualified mechanics will be able to assist you. the VAT inclusive price, special offers and the features and benefits for a range of tyres suitable for your car, 4x4 vehicle or van. We stock and can supply all major tyre manufacturers at a guaranteed low price. 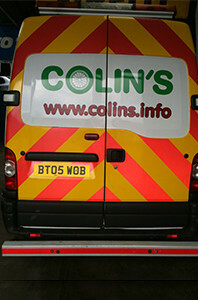 At Colin's we also supply and fit exhausts and batteries. At Colin's we also supply and fit exhausts and batteries. Offer Breakdown Recovery, Vehicle Servicing, Wheel Alignments, Bosch Diagnostics, plus many more services. We understand that a flat or popped trye can happen at any time. If it happens to you there is no need to worry. Give Colin’s a ring and we’ll send someone out to take care of the problem for you.